An incredible, all purpose blend of herbs and spices, but without any salt! Sprinkle liberally on all foods in place of salt and pepper and enjoy the difference. 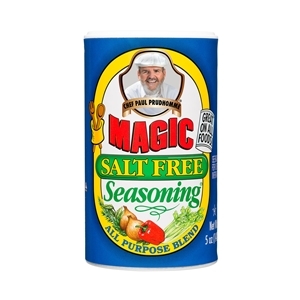 Magic Salt Free Seasoning® contains no MSG, no gluten and no preservatives. It's a TRUE salt free seasoning. Ingredient: Onion, chilies, bell peppers, brown sugar, garlic, paprika, spices, natural flavor, vinegar powder, calcium stearate (anti-caking agent).